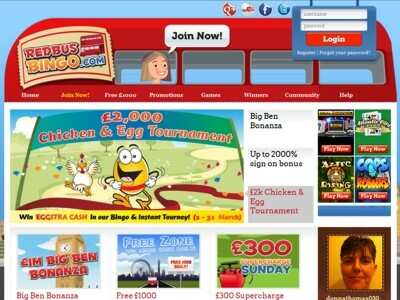 Redbus Bingo is a quintessential British bingo site. Of course what could be more British than the big red buses. So in the spirit of Britain play 90 ball bingo and have a blast today at Red Bus Bingo. RedBus Bingo is brought to you by the owners and operators of the massively popular Wink Bingo and Posh Bingo so players can expect the very best in bingo games, promotions and of course, jackpots. The site is themed on the London Double Decker bus and follows the theme in a good humored way across the site so you have promotions with names like Big Smoke, Big Ben Bonanza and Oxford Street Shopping Spree, West End and Beefeater Chat Game. The bingo site has a simple layout and is easy to navigate so even newbies to the world of online bingo can find their way around the site. The games don’t require a download and all you have to do is sign up and before you know it, you are ready to play! The home page has simplified links which offers information on games, promotions, a superb FAQ section and information about different online bingo games. At RedBus Bingo, players are offered both 90 ball and 75 ball bingo games as well as their progressive jackpot counterparts; the London Eye which is the 75 ball progressive jackpot and is won on the London Eye pattern in 45 calls or less and the Double Decker 90 ball jackpot which is won when players cover their card in under 37 calls or less. Online Bingo variants include team bingo, penny bingo and of course free bingo. For those that fancy a break from bingo gaming, the site has an exhaustive collection of instant games including slots, casino games and scratchcards. Casino games include Blackjack, Roulette, Video Poker while instant wins include HiLo, Quickfire Lotto, scratchcards amongst others. In terms of slot games players can try out popular titles such as Bejewelled slots, Sands of Fortune, Paradise Reels, X-Factor slots and Shamans Dreams slots. Red Bus Bingo has five progressive jackpot slots games for the high rollers including the Fluffy Favourites game which as a maximum win of £50,000 and the site’s very won instant game which can win you £25,000. Signing up at the UK bingo site is incredibly simple and takes a matter of minutes and players are guaranteed the utmost safety and security when they provide their payment information. New players are welcomed with an amazing offer of a 300% cash match bonus plus 40 free spins. In terms of promotional offers, this UK bingo site has it all; the chance to win £1,000 every day with free bingo games, £2 Big Smoke which is played on the last Friday of every month for a £2,000 jackpot, £150 Oxford St. Shopping Spree, £200 West End and so much more. Payment options at the site include credit cards, debit cards, Neteller, Delta, UKash, Paysafecard and Solo and customer service is available 24×7 on live chat, email and the telephone. Sign up at today. Slot lovers can’t get enough of the instant slots. There are lots great games just waiting for you including; Jewel Journey Slots, Sands of Fortune, Paradise Reels Slots, X Factor Slots and many more. Check them out with 40 free spins when you join. This bingo site has been tested, reviewed and approved. You are guaranteed to go on the journey of a lifetime! Loyalty Program: As a loyal member they will reward you with bonus point for many of your actions such as referring a friend, playing games and more. Later, you can convert these points into cash in your account or exchange them for other special treats they may offer you from time to time. Sign up now for an incredible offer and enjoy your 300% free bonus at RedBusBingo.com and don’t forget the 40 free spins. RedBus Bingo is one of the leading bingo sites on the web and quite simply, one bus you won’t want to miss!